Stamped concrete allows consumers to “mask” their concrete, making it look like more expensive options such as bricks, pavers or stone. Many contractors are able to create intricate patterns and designs, using colored cement, different types of aggregate or inlaid surfaces. When properly installed and maintained, a stamped finish can offer all the benefits of concrete, as well as a beautiful appearance for any home. The process used to create stamped concrete will vary depending on the design that you require and your concrete contractor’s process. However, generally a base layer of concrete is laid to create a flat, solid work surface. Then the top layer is put down using concrete prepared specifically for your design, whether it has been colored, includes special aggregate, etc. If you are using multiple colors, the coloring may be added after the concrete has been laid down while it is still wet. Once the concrete has partially dried, but is still able to be imprinted, release powder is spread across the entire surface. This ensures that stamps will not stick to the surface and leave undesired marks. The release powder can add to the stamped finish, giving an aged or antique appearance if desired. Special stamps are then applied to the concrete and pressed into the surface. Generally, a roller is used to ensure that stamps are applied evenly across the entire area. Stamps can offer a wide variety of imprints, such as brick or stone patterns, mottled surfaces, faux aging or intricate designs. These may be generic stamps or special designs created for your project. Once the stamp is fully pressed into the concrete and left for a short time, it is pulled up carefully to leave behind the desired design. If color has not been applied previously, stains may now be applied to achieve the desired effect. The concrete is left to properly cure, and then a seal is applied to create a protective coating. A seal is especially important for stamped finishes due to their increased cost and to avoid fading of colors. The pricing of stamped concrete can vary greatly depending on the size of the project, the amount of work required, the intricacy of the design, etc. As with most concrete installations, the price per square foot will diminish as the size of the project goes up, though this may not occur if the design is particularly difficult or requires special craftsmanship. In general, you can probably expect to pay 2 to 3 times as much for a stamped concrete project as you would pay for generic concrete installation. But this is still less than pavers or stone which will eventually have weeks growing through the seams and not have nearly the variety of finish possibilities. 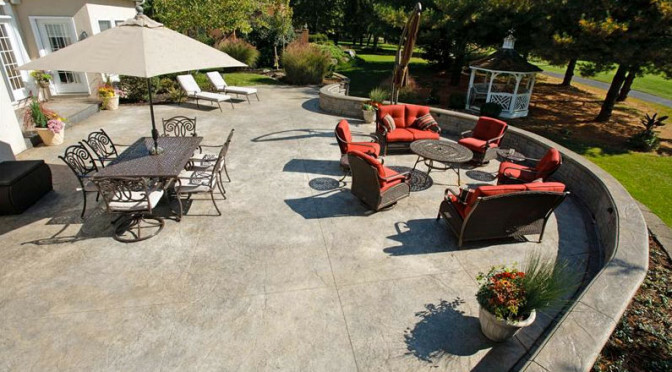 Stamped concrete requires very little maintenance, akin to normal concrete. However, it is important to perform some maintenance in order to maintain the integrity of the sealant used, as well as avoid fading or deterioration of the design. In areas where there is frequent or hard use or exposure to the elements, such as driveways or patios, it may be prudent to reapply a sealant annually or every few years. Ensure that you properly clean the surface prior to reapplying.